There has got to be something better than email. Email has been around longer than you think (you check out the Wikipedia page for the full run-down), and while some of the email clients have advanced and helped us better sort the wheat from the chaff, the majority of us still feel that email is like one, big, never-ending game of Tetris. As each email comes in we move it, push it and poke it in hopes of getting it into the right place, but it doesn't end and, like Tetris, the pieces just continue to fall until the screen fills up and all we can do is claim email bankruptcy. For almost as long as email has existed, people have complained about getting too many emails. We celebrate inbox zero as if we just gave birth to a new child. While some lauded the arrival of the first BlackBerry, many saw it as a digital manifestation of the ball and chain that would shackle them (at nights and on the weekends) to their office. While many saw mobile email as a liberating force, many curse the day that getting email anywhere and everywhere was invented. As strange as this may sound, there was a moment in time (and it wasn't so long ago), that once you left the office you did not hear from the office. If something were a real emergency, you might get a phone call to your home number, but those moments were truly few and far between (unless you were a doctor or someone whose job involved a true emergency -- as in someone's life is dependant on it). Email makes life easy. With it, comes a new reality: we create more emergencies (the kind that aren't truly life threatening at all). For most, email is clutter. "...according to [pdf] a Blue Kangaroo online survey of more than 1,000 US adults aged 18-64, a whopping 43% said that more than half of the new emails in their inbox the week prior to the survey came from marketers (including daily deals, retail newsletters, and sales alerts). In fact, 8 in 10 respondents said that more than 20% of their new emails came from marketers." Regardless of how accurate this report is, we can't deny how challenging email has become. The level of fatigue that the average consumer faces with each and every ping of their inbox is astounding. 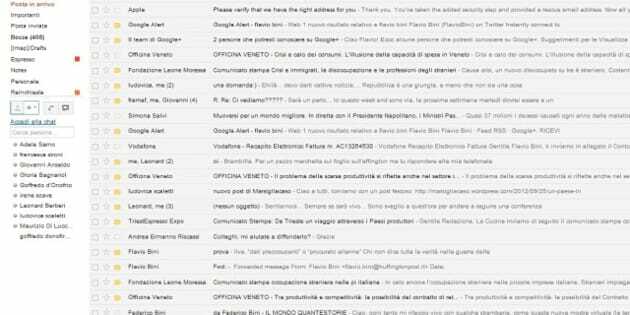 There are several companies (some established and some startups) that are trying to solve the problem of email. Some will tell you that young people don't use email (unless they need to communicate with a parent or grandparent). That these young people are abandoning email and using platforms like texting, chat or even Twitter and Facebook to communicate with one another. Shorter, faster and near-real time. Some of that makes sense, but for the vast majority of corporations, that won't cut it. Email doesn't just need a facelift in terms of making it more relevant to the incoming workforce, it needs to make itself relevant in the social age as well. Email as a mechanism for tribal knowledge. When we rethink email, it has to push beyond how we file, store and manage this information. Because email was created before the advent of social media and other collaborative tools, we now need to figure out a way to unlock a lot of this communication. We need to make it as shareable and as findable as possible to those that need it. Think about your daily communications and how much of that information may be valuable to others (it could be a new employee who is not as well-versed on your corporate culture as they should be, and it could be a way to enable others to have access to the information without having it litter their own inboxes). At the same time, we need to ensure (now, more than ever) that private email communications remain that way. In short, email needs to reestablish itself as a channel that drives both value and efficiency, instead of one that simply pesters and annoys. Wouldn't it be nice to once again enjoy the sentiment, "you've got mail"?